Below is a list of foods that we buy. This is just what we happen to like and to the best of my knowledge, they are GFCF, but I could be wrong, so please double check for yourself. Along with these, we cook a lot from scratch and choose to use organic chickens and organic meat and organic fruits and veggies whenever possible. To the best of my knowledge, these are also approved on Feingold (meaning no artificial ingredients, though this year is the first time they are listing GFCF approved foods so I haven’t checked out all of the products we buy yet). Update: Check out my Pinterest boards for updated GFCF food products, recipes, and candy and gum. Still updating these boards daily. Pinnacle Gold Potato Chips (order from http://www.glutenfreemall.com/) Update: I can’t find these anymore. Food for Life brown rice bread (contains peaches). Anna’s bread mix is one of the best sandwich breads (HFS or online). They also make good muffins. We liked pumpkin and banana. Below are foods that we used while transitioning to GFCF, but then removed after a couple months. Most contain soy or have cross contamination (CC) issues. Soy is very similar to casein and is a hormone disruptor so can affect mood/behavior. I didn’t know this in the beginning so we didn’t pull them till later. Soy causes my daughter to become very emotional, weepy, tantrums. It causes my 2 year old to become very aggressive – biting and hitting, and hyper. Note: All Whole Foods’ 365 brand foods and Trader Joe’s brand foods probably have CC issues. Many people have had problems with them, but if you are not very sensitive, you may be alright. This includes their frozen and fresh fruits and veggies. I noticed on my TJ’s fresh carrots and salad, the bags say “Made on equipment that processes wheat, eggs, milk, etc.” All of the products made for the company are all produced in the same facility and on shared equipment, so they would all have cross contamination issues, so watch for that. Rainbow Unscented shampoo (WF or online, has soy). We use Ivory Soap (unscented) for Feingold, not sure about GFCF. Tom’s of Maine toothpaste for kids (fluoride free strawberry or orange). Flouride is bad. Google it for more info. Burt’s Bees chap stick (this does contain soy). I’ve heard www.tropicaltraditions.com sells an Unscented chapstick (search lip moisturizer) without soy, but haven’t tried it yet. Soy is in the form of Vitamin E a lot of times. Shower and bath balls to remove chlorine from the water. I ordered on http://www.amazon.com/. Or you can find at WF or your local HFS. Surf Sweet Gummy Worms and Gummy Bears (no corn syrup!) (I found these at Whole Foods, my local HFS, and on amazon.com) The gummy worms are better and softer than the bears. Sharkies Gummy Snacks (these are kind of like candy). I ordered a box from Amazon.com. Annie’s has good fruit snacks too, from WF. B-Fresh Bubble Gum (contains oranges. Good. No sugar. Uses xylitol. Tastes like Trident) or Spearmint, or a new one is Solar Melon Moon which tastes kind of like Juicy Fruit. I order from www.iherb.com. You can use the code PIW329 and get $5 off your first order. Or I order from www.amazon.com. Xylichew gum (spearmint or Tangerine) from Whole Foods near the toothpastes. These contain soy. Jelly Belly Naturals (we like Tropical Fruit). Make sure you get the ones that say naturally colored and flavored. I’ve found at Whole Foods, sometimes at Border’s Books, or order online. Or Cracker Barrel has the Snapple All Natural ones. Yummy Earth suckers www.yummyearth.com/feingold. These are about the only suckers without corn syrup. You can get a big discount using this link. You get a bulk bag of 300 suckers for around $25 or so. Still checking out the candy that would be GFCF and FG…. For more info on the Feingold Diet, check out my book “All Natural Mom’s Guide to the Feingold Diet – A Natural Approach to ADHD” available now on Amazon! Posted in GFCF Diet and tagged GFCF Diet Info. Thanks for posting all of this. 🙂 It is very helpful. We went off GFCF, and are back… with peanut allergies. 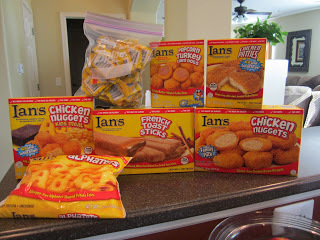 Lots of food our kiddies can't eat… Your list was helpful! Have you seen this diet work on children who have epilepsy? My son is on the modified Atkins diet. But Im interested in cutting all gluten in his diet. He does have dairy products like cheese due to fat and calcium needed for his reduction in seizures.